There are many entrepreneurs who really believe their new shiny thing will disrupt the market. Their investors, their staff and they themselves would save everyone a great deal of pain and loss if they really understood what disrupting a market actually entails. Real disruption is characterised by the following five traits which everyone needs to be clear about. Disruptive innovations enable non buyers to become buyers for the first time. This is often a function of a new price point or business model which opens up the opportunity for non buyers to access products. It takes time to convert non-users of a product category to start buying for the first time. You need to be patient. The value proposition that motivates these non buyers to buy is not appropriate for existing buyers in the market. in fact, it is shunned by them because it doesn’t perform the job they value offered by incumbent providers. Do not try and compete against the incumbent value proposition, you are unlikely to succeed. 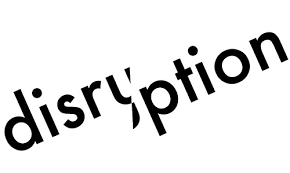 Successful disruption is characterised by the new value system overcoming the incumbent one without the incumbent operators seeing it coming before it’s too late. Never alert the incumbent you’re going to disrupt their business. Just do so. Take Kodak as an example. For a hundred years it dominated the world of camera film. Sure Fuji did well in the high end professional segment but Kodak dominated the mass market for film around the world. When camera phones emerged with their not very good image quality, well before smart phones had become ubiquitous, it enabled children and teenagers to take pictures for no cost. For them, the cost of developing a film was far too high for most to afford without their parents paying. Suddenly they had a tool for creating media they could control without their parents involvement. Ironically, Kodak owns many valuable patents for digital imaging but failed to predict the pace of change which happened within a generation. Apple, Samsung etc had eaten their lunch before they realised it and built and entirely different value network around digital devices. The most important factor for success is that you need a deep understanding of people, their unserved needs and their incentive to start buying (and using) your innovation. Vision and deep pockets alone is not enough.